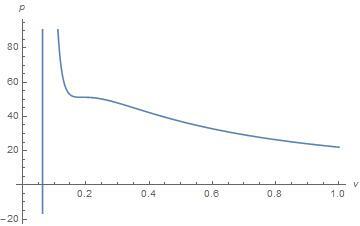 Hello I'm new to mathematica and I have been trying to plot an isotherm for a substance at its critical temperature, using Van der Waals equation of state. I have done all the work except I do not know why my code is not outputting the graph; it simply outputs the graph with no line in it. Any help is appreciated! P is VDW equation, Tc is the critical temperature equation with parameters a and b and I am using the Plot function to graph the isotherm. The way you have your code set up, your equation for pressure never calls for the value of Tc, instead it tries to use an unknown variable you have called T.
Not the answer you're looking for? Browse other questions tagged physical-chemistry thermodynamics equation-of-state or ask your own question. Finding the thermodynamics of protein unfolding from temperature and absorbance using fluorescence spectroscopy? How can I calculate the boiling temperature of a pure substance as a function of pressure? Why might copper have a lower heat capacity than lithium according to the Shomate Equation? How could the ideal gas law be discovered from experiments on real gases?